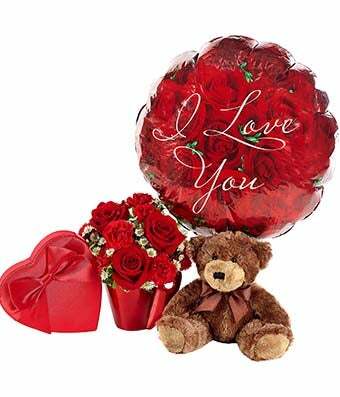 Make her heart flutter with a red rose teddy bear basket that will show her how much she means to you. From You Flowers' is offering the You Lift My Heart Bouquet this year, which is the perfect romantic gift. Delivered with a flower arrangement with red roses, red mini carnations and white monte casino. Paired with the red rose bouquet, your love will receive an 'I Love You' mylar balloon, a box of chocolates and a plush teddy bear.